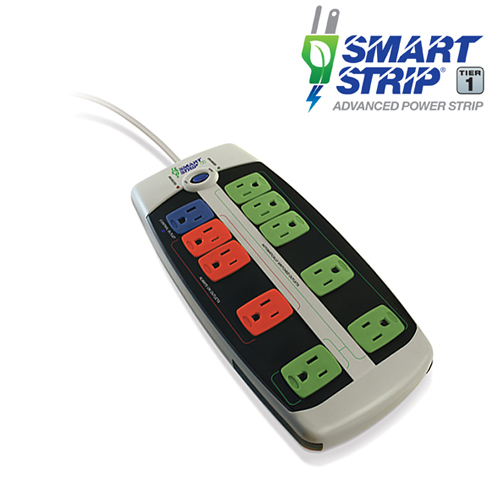 The LCG3M Tier 1 Smart Strip® has ten color-coded outlets with one control outlet (blue), six power-saver outlets (green) that will electronically unplug connected equipment and eliminate vampire current usage, and three “always on” outlets (red) for equipment that needs power continuously. The LCG3M Advanced Power Strip features a sophisticated surge protection circuit with 4380 joules of protection to guard your equipment from voltage spikes and current surges. The 10-outlet Smart Strip® has 4 transformer outlets and comes with a 4’ heavy-duty power cord with a 90° right-angle space saving plug.